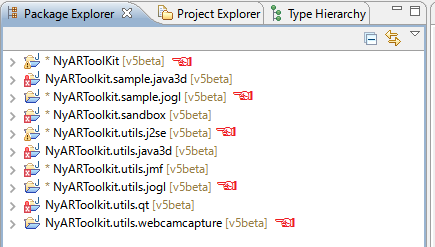 NyARToolkit for Java 5.0.0 has been released. NyARToolkit 5.0.0 supports the natural features tracking which is same as implemented on ARToolKit5 (NFT) . The development of NyARToolKit5 has received the funding and technical assistance by DAQRI LLC. I’m grateful to DAQRI LLC and ARToolKit team. 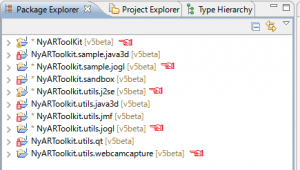 Import NyARToolkit projects to Eclipse. Make sure that there are no errors in the project shown in ←. Print NFT image to paper. If you do not have a printer, display the pdf file into the screen. Connect your webcam to computer. 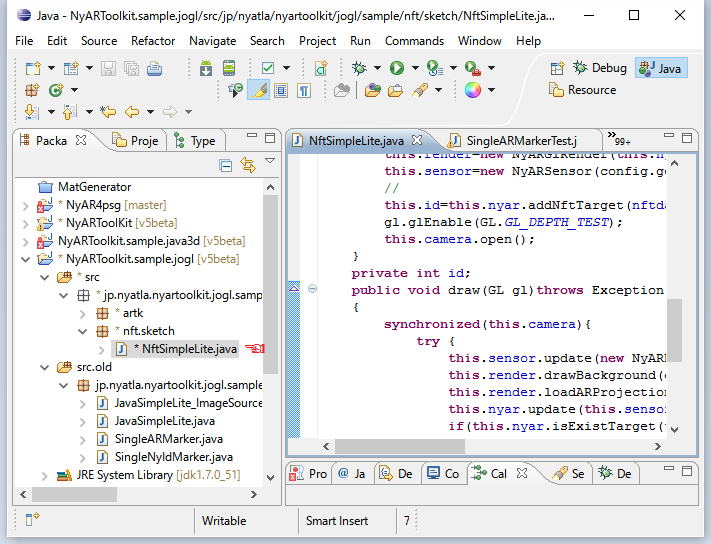 Run NftSimpleLite.java in NyARToolkit.sample.jogl package. It takes a few seconds to startup. 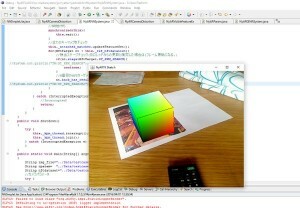 When you take a picture with the camera, The color cube will display on image. NFT programming with NyARToolkit is simply. It requires only a few dozen lines of code. 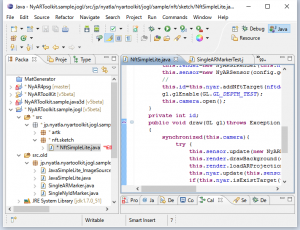 NftSimpleLite.java is a template of NFT application. You can create the unique application by modify the template. How to change the tracking image file? →Change nftdataset value. In NFT, it need to place 3 files(.iset, .fset, .fset3) onto same path. For example: If you specify “d \\ example”, “c:\\ example.iset”, “c:\\ example.fset”, “c:\\example.fset3” will be used as a tracking image. How to change the tracking image size? →Set the paper image width in mm to the second parameter of addNftTarget function. How to make the tracking image set file? →NftFileGenerator.jar is a fileset generator. Download NyARToolkit.utility.zip from the following URL. Calculation algorithm of NyARToolKit is identical to the ARToolKit5 but there is a slight difference. The cause of the difference are the accuracy of floating-point calculations, and the simplification of the math functions. The NyARToolKit and ARToolKit data files(iset fset fset3) are compatible. These files can be used with each other.